Over the last week we have taken advantage of the dry weather to electrofish the River Tromie from bottom to top. The Tromie joins the Spey a short distance downstream from Kingussie on the east side of the river. 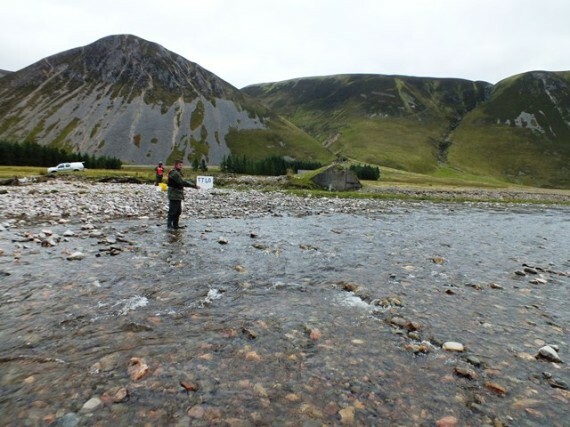 An interesting river, it has a hydro dam in the upper reaches which abstracts a lot of water but also provides flow regulation; to the extent that the Tromie didn’t suffer from the massive spate that most other Spey tributaries experienced on the 11th Aug. The reservoir was low before the spate to it was able to hold back a lot of water with only a minor spill event. 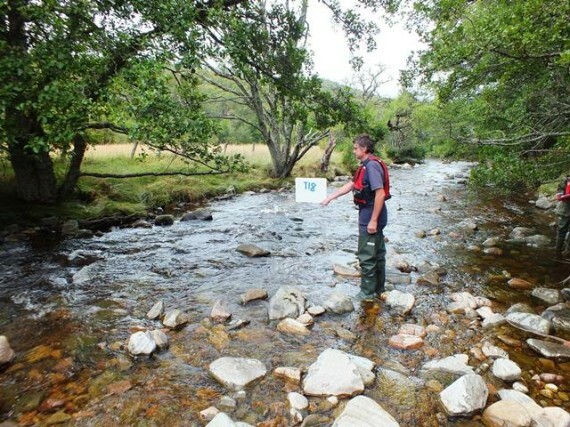 In order to try and get a good understanding of the fish population we completed a number of timed surveys on the mainstem as well as some quantitative mainstem and tributary surveys. The river downstream of the the hydro dam to the confluence with the Spey is 16.5km in length with a drop in altitude from 425m to 220m; a gradient of 1.24%. Nine timed surveys were completed in this stretch. 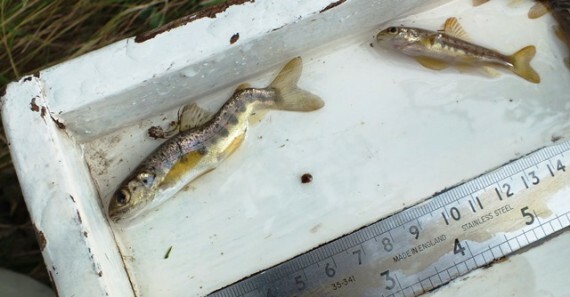 Salmon fry were found at all sites although generally in low to moderate numbers. The mean salmon fry count per minute in those nine sites was 6.4 (compared to 18+ on the Spey mainstem sites this year) with the range from 14 to 2 per minute. This fits with previous surveys on the Tromie where low fry densities were the norm. Parr counts averaged 3 per minute, similar to the Spey mainstem. The results from the five density surveys completed downstream of the dam were interesting. Here the mean salmon parr density /100m was 15.9 compared to 9.5 salmon fry. 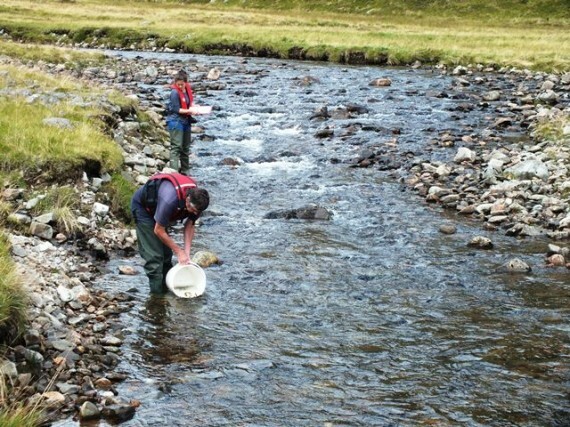 It is unusual for the parr density t be higher than fry although one of the sites was a short distance downstream of the dam where there were very few fry. Possible hybrid salmon:trout fry from the site below the hydro dam. A chunky fish with a trout like wrist it had characteristics of both species. The upper fry was one of only a few true salmon fry found at the site although parr were abundant. The parr density at this site was the highest recorded in twelve surveys over fifeteen years at this site, but the fry density was the lowest. The fry at the timed site 250m downstream of the dam were the largest perhaps benefitting from some additional feeding from the loch water? Our conclusion was that the parr population below the dam was pretty good it could be even better if the availabilty of spawning gravels were not a limting factor. One of the major side effects of dams and impoundments is their impact of sediment transport downstream. Sediment can only move in one direction so there has to be a supply from upstream to maintain the ecosystem for gravel spawning fish like salmonids. Both the Tromie Dam and Allt Bhran intake effectivly throttle the supply of sediment to the lower river where there is a lack of the smaller substrate sizes. Upstream of the Tromie Dam there are no sediment supply issues; the complete opposite infact, there is a super abundance of sediment. The Allt Gharbh Ghaig (pron. “Garry Gig”) is a highly mobile river with an incredibly steep catchment, much of which is bare rock or rock and scree. It is known to be highly responsive to heavy rainfall or even snow melt. Upper survey site in the Allt Gharbh Ghaig. The river channel itself is only about 10m wide but the river bed is about 80m. This must be an incredibly hostile environment for juvenile salmon. 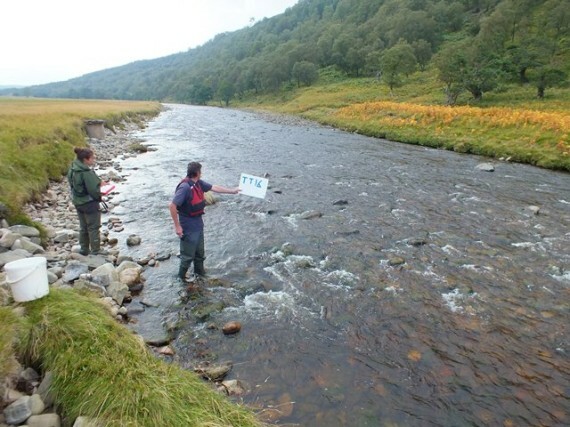 In the Spey catchment only the Feshie can compare in terms of river mobility. There is little point doing any density sites in a mobile river like this; any site will never be stable enough for repeat survey comparsions to be made so we completed four timed sites. Salmon fry were found only in the lower site (1 per minute) and parr only in the lower and uppermost sites. 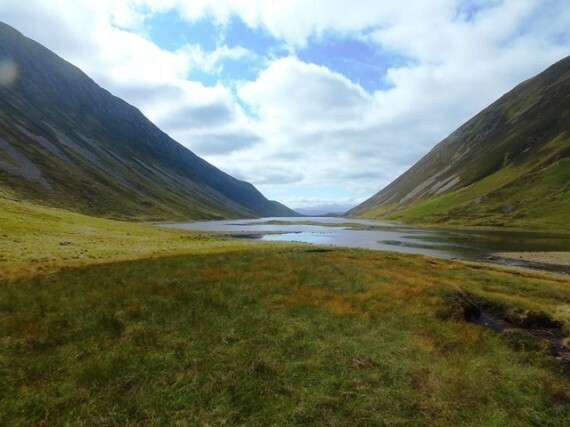 The lower timed survey site in the Allt Gharbh Ghaig. We found three salmon fry, four salmon parr and a few trout at this site. 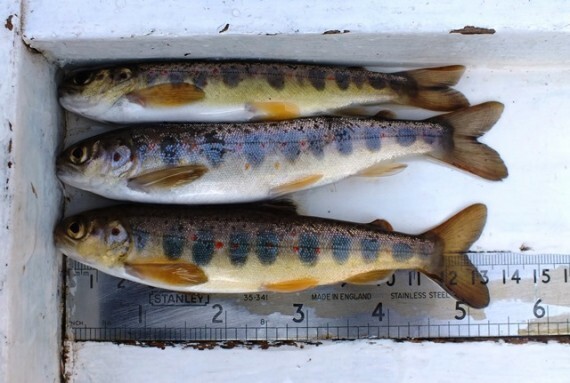 The only three salmon parr from the upper site. They were all large, probably 2+ years old at least. 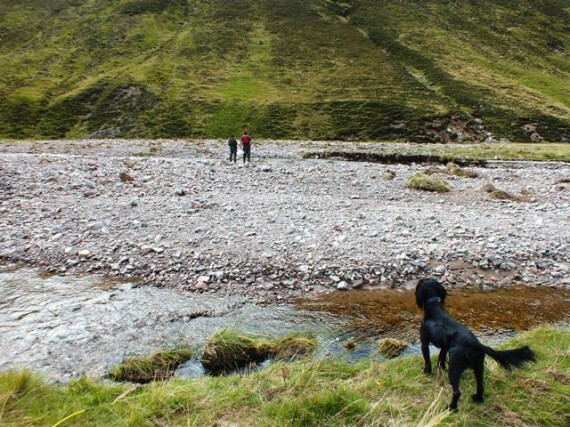 Spawning gravel injection site on the banks of the Gharbh Ghaig. None of this gravel can progress downstream of the dam but perhaps it should be helped on its way? The other branch of the upper Tromie catchment flows through two natural lochs and is much more stable. The Dubh Bhrodainn downstream of Loch Bhrodhainn. 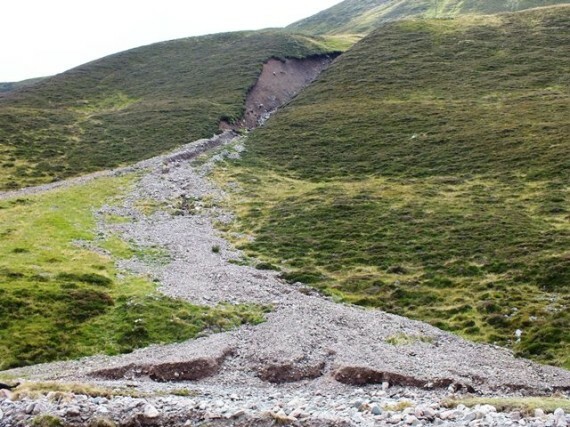 The picture shows the Allt Bhrodhainn confluence where the recent spate had dumped a load of gravel into the larger river channel. Our survey site just downstream of the footbridge produced quite a few salmon and trout fry and parr. Upstream of Loch Bhrodhainn the Allt Loch an Duin provides pretty good instream habitat for juvenile salmon. We completed one density survey in a site which had only been surveyed once before; in 1999. 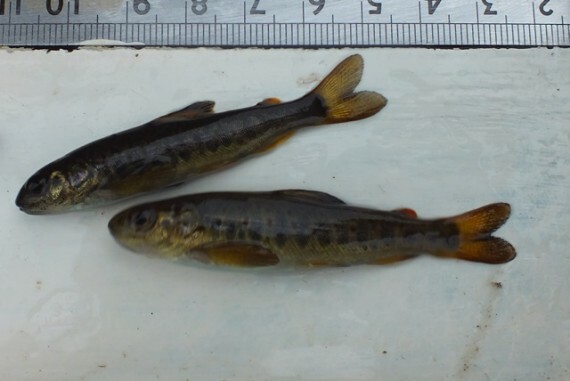 The results were similar; less salmon parr but there were salmon fry present this year where there had been none in 1999. There were a lot more trout fry and parr this year. The Allt Loch an Duin site between the Loch an Duin and Bhrodhainn. The upper site was just below Loch an Duin. For the first time ever we found neither salmon fry nor parr at this site, although they were never abundant. The site itself is only 100m or so downstream of the loch and is on the very margins of salmon habitat in this part of the catchment. Loch an Duin looking south. Just beyond the far end runs the Edendon Water, a heavily abstracted tributary of the River Garry in the Tay catchment. Although salmon were absent from the very upper site it was good to see that they were present in several sites upstream of the hydro dam. The smolt production above the dam will not be high, the river connecting the two lochs is much more significant in that respect that the Allt Gharbh Ghaig, but it seems to be found a sustainable level. Smolt production in the Allt Gharbh Ghaig itself will be ultra low, perhaps only a couple hundred, but this is salmon habitat at its most volatile and hostile. To conclude this description of the Tromie I’l, relay a good story from Bob Laughton. He told about when he took a couple previous Delfur ghillies up this part of the catchment to do some salmon redd counting in the autumn. 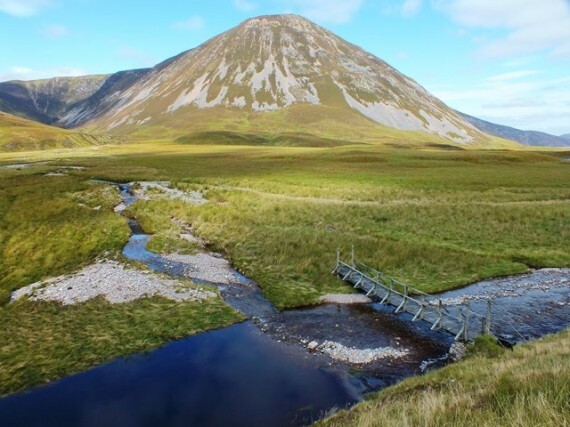 There could hardly be a greater contrast between the lush surroundings of Delfur and the wild hills of the Gaick Estate so it should be no surprise when the ghillies declared that it was a waste of time redd counting in this desolate place. Much to Bob’s delight, and I’m am sure the ghillies also, just where they stopped the pickup there were a pair of spawning salmon in the stream below – they are still there.